There will be another 12 pages about the Great Lake Monster mystery in RETROFUTURE 7 in the Spring. 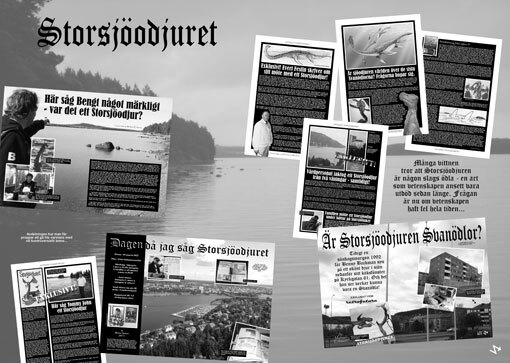 Since the start of this publication back in 2010, I have published a 60 page special called “Storsjöodjuret” (“The Great Lake Monster”) about the subject, plus many pages in the ordinary issues of RETROFUTURE as well (over 90 after issue 7). I have presented forgotten history, previously unknown cases and I have even got a retired journalist to speak out in these pages (something he never did when he was active, for fear of ridicule) about a sighting he had back in 1992. It goes without saying that local interest for this is very high here in Jämtland (county). The truth of the matter is that almost everybody in these parts have heard somebody relate to a story about these elusive animals from somebody close. There are many hundreds of press cuttings in the local archives and witnesses includes pilots, politicians, military personel and people from all walks of life. I saw this myself back in 1977 (see earlier posts) so I have no doubt whatsoever that the mystery is real. We just have not figured out the answers yet. RETROFUTURE has been on the case though and it has been great fun I have to say. 12.000 magazines (and 3.000 flyers) have been handed out for free around the lake to attract attention to the fact that this publication is doing what local media could, but will not. To seek the truth. And the best way to do this is to talk to witnesses. I have met many now, talked to even more. Not long ago I talked with a man that served on a now closed Air Force base (F4) for an hour about a sighting that involved several witnesses, that happened over 40 years ago. Like many other key witnesses, he does not want to go public as yet. But he has no doubt. There must be thousands of witnesses by now. Some day we will know what this is and it will be one hell of a day. Until then, we can only speculate, and RETROFUTURE is doing a bit of that as well. That alone is a unique twist and I think it will go down in local history.